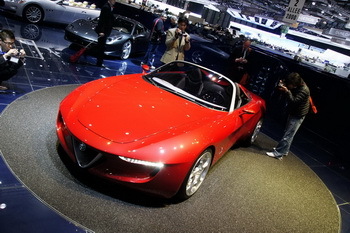 Pininfarina is 80 years old and it has started the celebrations for this important milestone at the 2010 Geneva Motor Show by holding the world preview of a concept car, the 2uettottanta. 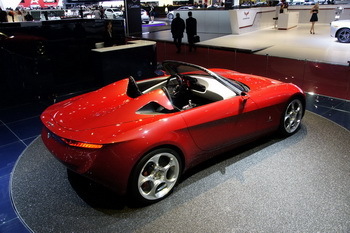 The decision to link the company’s 80th anniversary with the development of the 2uettottanta, a concept car with Alfa Romeo mechanicals, reflects Pininfarina’s desire to look to the future with optimism. The 2uettottanta interprets and evolves certain strong elements of the Alfa Romeo-Pininfarina alliance and represents an innovative approach, projected into the third millennium, to a theme that is firmly rooted in Pininfarina history, the 2-seater spider. Pininfarina is 80 years old and it has started the celebrations for this important milestone at the 2010 Geneva Motor Show by holding the world preview of a concept car, the 2uettottanta, and of two examples of recent highly successful stylistic collaboration agreements, the Ferrari 458 Italia and the Maserati GranCabrio. So 80 years have gone by since that day, May 22, 1930, when Battista “Pinin” Farina (the surname was changed from Farina to Pininfarina in 1961 by Presidential decree) founded Società Anonima Carrozzeria Pinin Farina in Turin, a small artisan workshop that turned out small production runs and special bodywork to order for wealthy private clients. Numerous Pininfarina creations are now part of the prestigious collections of museums in Italy and abroad, such as the MoMA of New York, which acquired a Cisitalia 202 Berlinetta in the 1940s. Pininfarina design has received numerous prizes in its 80 years of history, the most recent being: the “Louis Vuitton Classic Concept award” for the Maserati Birdcage 75th; the “red dot award 2008” for the Sintesi; the “Compasso d’Oro 2008” for the Nido; and the Trophée du Design 2009. Sergio and Battista “Pinin” Farina are both members of the famous European Automotive Hall of Fame, an institution created to celebrate the men who have made motoring history. The rapid changes that have taken place on the global market in the last two years, and in particular the unprecedented crisis that has hit the motor industry, have inevitably also affected the current physiognomy of Pininfarina. On one hand, one of the pillars on which the company has relied since its origins has vanished, the production of cars for other manufacturers: a tangible sign of this transformation was marked at the end of 2009 by the sale of the Grugliasco plant which sanctioned Pininfarina’s transformation from artisan concern to industrial company, when it was inaugurated in the 1950s. On the other, the scenario has changed and the opportunities linked to zero emissions urban mobility have grown significantly: the world focuses increasingly on protecting the environment and Pininfarina was the first Italian industrial company, and one of the first in Europe, to propose a 100% electric concept car. Today, while all the large carmakers are focusing on the electric car as an opportunity, Pininfarina takes another step forward, promoting a philosophy that includes the choice of electric transport, both individual and collective, as part of a new lifestyle that everyone should adopt in order to increase energy saving, protecting the planet at the same time. This is why eco-sustainable mobility has become one of the three pillars on which the Group’s industrial plan now rests. It would be difficult to think of a better place to celebrate Pininfarina’s 80 years of activity. The Palexpo in Geneva is this week hosting the eightieth edition of a Motor Show that Pininfarina is particularly fond of: it is also thanks to this event if the company has been able to acquire such fame and build up its international image, laying the foundations for the credibility and iconic power of its brand. And, except for a few rare exceptions, Geneva has hosted the debuts of dozens of show cars and research prototypes developed over the years. The 2uettottanta is no exception. 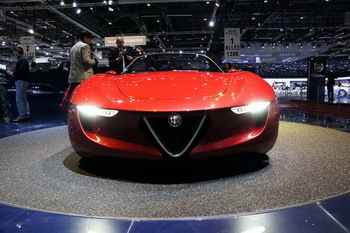 The decision to link the company’s 80th anniversary with the development of the 2uettottanta, a concept car with Alfa Romeo mechanicals, reflects Pininfarina’s desire to look to the future with optimism. The 2uettottanta interprets and evolves certain strong elements of the Alfa Romeo-Pininfarina alliance and represents an innovative approach, projected into the third millennium, to a theme that is firmly rooted in Pininfarina history, the 2-seater spider. It is an iconic object that links Pininfarina’s past and future with an imaginary thread. To put out its 80 candles, Pininfarina gave itself another gift. At Geneva it is exhibiting two gems with the Ferrari and Maserati logos, the 458 Italia and the GranCabrio, which earned Pininfarina the Trophée du Design 2009 from the French periodical L’Automobile Magazine.